A decision handed down by Poland’s Constitutional Court in July threatens to upset one of the country’s most cherished traditions – the weekend migration to the family allotment. By ruling aspects of the 2005 laws regarding allotments unconstitutional, because they infringe on the rights of landowners, the court has raised the prospect of some city gardens being sold to property developers. It sometimes feels that nothing has been left unchanged by Poland’s torrid, 20-year romance with capitalism and modernity. But there are zones in every Polish town and city where time has stood still, sectors screened by hedges and rusty gates where you can easily believe it’s still 1954. These are Poland’s garden allotments (ogród działkowy) – over one million plots of land nationwide set aside for the health and wellbeing of the urban masses. And officialdom is the other source of that nostalgic whiff. Every collection of allotments has a ‘community house,’ painted in institutional green and tan and pinned with laboriously complex rules and regs subdivided into countless paragraphs. Allotments feel like old fashioned, monolithic state institutions. In fact, the Polish Union of Allotments (Polski Związek Działkowców, PZD), the umbrella body responsible for the management of Poland’s 45,000 hectares of ogród działkowy, was created in the Communist era, in 1981. It is the PZD that finds itself in the spotlight following the Constitutional Court’s decision. The court’s primary objection to the law as it stood was that PZD had the monopolistic right to manage the land under its control in perpetuity. The majority of this land belongs to local authorities, some to the nation, and a smaller fraction to private landowners. As the law stood, none of these groups would ever have the right to dispose of or profit from this land. Many of those who benefit from the use of an allotment regard this as an admirable idea, but it cannot be legally reconciled with property rights enshrined in Poland’s more recent constitution. Other objections to the provisions of the 2005 law include the fact that local authorities are required to support PZD activities, that the PZD must agree before any allotment land reverts to its owner’s control, and that the PZD is exempt from normal property and business taxes. The Constitutional Court has identified what it sees as a problem, but cannot provide the answer. It has suspended much of the 2005 law, and given parliament 18 months to replace it with something better. Until that happens, allotment holders will suffer an agony of waiting. In the worst case scenario, land returned to local authority control could be sold off to property developers. For Krakow, a city with mounting debts and hundreds of hectares of land currently given over to allotments, the prospect must be mouth watering to some. Representatives of the Constitutional Court have made it clear that they wish to preserve allotment gardening – their target is the PZD. But with the current law suspended and no indication of what form a new law may take, allotment holders are understandably worried. “If this land disappears, a way of life will also disappear. It will tear people away from land they have been connected to for years. This will be a tragedy for older people,” said Ewa Błachut, vice-president of the Małopolska branch of PZD. 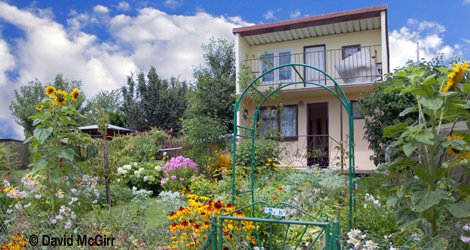 There are 9,533 individual allotment plots in Krakow, covering an area of 376 hectares. Of this area, about 25 hectares are in prime development locations in the city centre. Allotments are assigned to families, so an average family size of six individuals (over two living generations) means that almost 60,000 Cracovians will be directly affected by changes in the law. and partly because I am an allotment holder here in England. I am grateful for the brief history of the development of Polish allotments and associated habits and political pressures. and would like permission to post a copy of this article for “my” readers.